lake district accommodation for cottages, hotels, bed and breakfasts, self catering, hostels, camping and caravans. Tranquil, restful and freedom to move. What better holiday destination than an unspoiled coastline designated as an Area of Outstanding Natural Beauty and miles of level open countryside reflecting centuries of culture and heritage stretching eastwards to the foot of the Caldbeck Fells and northwards to the regional capital of Carlisle and the historic landmark of Hadrians Wall. Here, along the uncrowded Solway Coast and Plain, traditional Cumbrian hospitality awaits the visitor in family- run bed and breakfast, guest house, self catering, hotel, and caravan and camp-site accommodations at value for money prices. 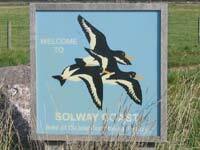 The Solway Coast is officially recognised as the area between the town of Maryport and Rockcliffe Marsh on the Scottish Border. It's a land of spectacular sunsets which attracts artists and photographers from countrywide. 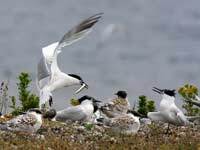 Dunes, saltmarsh and mudflats provide sanctuary and food to a wide variety of birds, insects, animals and rare plants. Spitzbergen Barnacle Geese winter here sharing the territory with the Oyster Catcher, Curlew, Pink Footed Geese, Plovers, Peregrine Falcon and, the Scaup, one of the country's rarest breeding ducks. Conveniently positioned Observation Points allow commanding views across the waters to the Scottish mainland and in between, the well integrated structure of the Coasts life is played out for all to see, enjoy, and marvel at. Occasionally visible close to the shoreline, one can also spot seals and dolphins. For those who venture out at low tide, please be aware of the dangers of rapid incoming tides. Tide times can be checked locally. Holiday accommodations are plentiful close to the coastline and can be found in and around the towns and villages of Maryport, Allonby, Silloth-on-Solway, Bowness-on-Solway, Mawbray, Beckfoot, Skinburness and Rockcliffe. Inland, the Solway Plain and its scattered communities form a storehouse of cultural and historical interests and nature conservation. The level paths, trails, bridleways, quiet country lanes and roads are ideal for the many walkers and cyclists who look for only moderate exertions in an uncluttered countryside. A popular walk is the “Smugglers Route”beginning at Maryport and ending at Mealsgate via Allonby and Hayton. Combine these with a wealth of respected golf courses, fresh water fishing, pony trekking, colourful town and village annual festivals, nature reserves and museums and you have something of interest for all ages. Tasty home cooked menus of local produce are the speciality of many country inns, pubs and restaurants accompanied by a choice of the regions famous real ales or an item from a well stocked bar of wines and spirits. Holiday accommodations are widely available in the larger communities of Wigton, Aspatria, Burgh by Sands, Bothel and Abbey Town and many of the villages and hamlets which together make this lovely region one of the most welcoming in the Lake District and Cumbria. The colourful history of the Solway Plain is well worth exploring. Over the centuries it has been home to the Romans, Celts and Vikings. A less well known indication of the Roman presence are two stones in Burgh Church on which there are carvings depicting an elephant and what has been suggested is a hippopotamus said to have been made by homesick Roman soldiers. Scottish raiding parties were regular visitors during the 17th and 18th C. In 1626 one such group stole the church bells of St. Michaels Church, Bowness-on-Solway. Unfortunately, both for the raiders and St Michaels, the bells were lost overboard en-route by sea to Annan on the Scottish shore. The villagers of Bowness retaliated by crossing the border and stealing the bells from Darnock and Middlebrie. It is said that to this day, following the appointment of a new priest to the area, the incumbent requests the villagers of Bowness to the return the bells. Staying close to Bowness-on-Solway, one mile away are the remains of a 19th Century harbour from where the wife to be of Woodrow Wilson emigrated. Well documented evidence and artefacts of these times are on display in the Tullie Museum of Carlisle and the Senhouse and Maritime Museum in Maryport. Naturally, as a William Wordsworth themed website we cannot fail to mention the National Trust maintained Wordsworth House in nearby Cockermouth, the birthplace of the great poet in 1770. Hadrians Wall. See our Hadrians Wall Walk Page for advice and information. Smugglers Route. Maryport-Allonby-Aspatria-Mealsgate-Ireby over a distance of 27 miles. Eden Estuary Trail. 7.5 miles. Cumbria Coastal Way. A section of this long distance route passes along the Solway Coast and the River Eden to Carlisle. Local Routes. Contact any of the Tourist Information centres listed on this site. Reivers Cycle Route. St. Bees to Tynemouth on the east coast. Eden Valley Circular Cycle Route. Carlisle to Brampton. Coast 2 Coast. Workington/Whitehaven to Newcastle or Sunderland over a distance of 140 miles. A network of local routes is available from any of the Tourist Information Centres listed on this site. Watchtree Nature Reserve. Situated on a former World War 2 airfield, this is one of the largest man-made reserves in Europe. 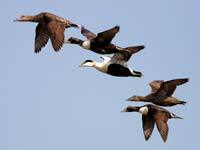 Bird viewing hides, picnic areas, refreshments and toilet facilities. Glasson Moss. National Nature Reserve. This is an area of deep soft peat and so take care when walking on the site. Keep to marked trails and footpaths. Campfield RSPB Reserve. 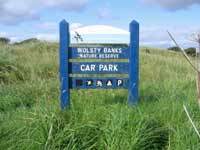 A wetland area teeming with wildlife and providing panoramic views over the Solway Plain. Barnacle Geese, Lapwing, Pink Footed Geese, Redshank and Snipe. Drumburgh Moss. Site of Special Scientific Interest. Seasonal sights of various plants, butterflies, moths, birds,reptiles and mammals. This is mossland so take your Wellington boots. Finglandrigg Wood. Site of Special Scientific Interest. One of the largest areas of woodland on the Solway Plain. Red squirrel, roe deer, breeding birds, insect and rare plant life. Skinburness. The surrounding area has been designated as a Site of Special Scientific Interest. Great opportunities for bird watching. Silloth Golf Club. Championship Links of 6641 yards. Stunning views. Maryport Golf Club. A well established 18 hole course. Carlisle Golf CLub. Open Championship Qualifying Venue. St. Michaels Church. Burgh By Sands. Built in the late 12C. St. Johns Church. Newton Arlosh. Original construction in 1303 but fell into disrepair and restored 1843. Holme Cultram Abbey. Abbey Town. Founded by Cistercian Monks in 1150. Restored 1883 and 1913. St. Marys Church. Wreay. Designed and built 1840-42 by Miss Sarah Losh in memory of her sister and parents. Contains many French and Italian features. St. Marys Church. Wigton. Dates from 1788. Fine stained glass windows. Maryport Aquarium. Over 2000 fish on display, café, gift shop, mini golf course, boating pool and play park. Buy an all day ticket. Solway Coast Discovery Centre. Liddell Street Silloth. Tullie House. Carlisle. A large collection depicting the history and culture of the region. Senhouse Museum and Maritime Museum. Maryport. Traces the development of the region over the centuries. Border and Kings Regiment Museum. Carlisle. Edward 1st Monument. Erected 1685. Stands at the end of the River Eden. Dabbins or Daubins. Early buildings constructed from mud. 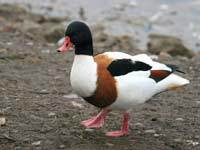 Some still remain and can be seen in and around Baldwinholme, Burgh by Sands, Thursby and Curthwaite. Melvyn Bragg. Wigton born broadcaster, writer and prolific novelist. A dedicated Cumbrian. John Paul Jones. Regarded as father of the American navy. Born in Scotland but lived in Whitehaven until his mid-teens. Returned in 1778 leading a raiding party on the port. Fletcher Christian. Born 1764 Cockermouth. A leader of the Mutiny on the Bounty. Michael Scot. Famed as a wizard of the Middle Ages. The only Britain to be damned to Hell in Dantes Inferno. Said to have lived at Holme Culfrum Castle. Maryport, Silloth, Allonby, Skinburness, Bowness on Solway, Burgh by sands, Abbey Town, Wigton, Aspatria, Dalston, Anthorn. "The first stop on the Hadrian's Cycleway on the edge of the Lake District." The Queens is a newly renovated Victorian home overlooking the park, sea and Scottish mountains beyond. Spacious en-suite rooms. Secure cycle storage. Take in the view from the dining room, where you will enjoy a satisfying, substantial English breakfast. Enjoy a comfortable night's sleep and a hot bath /shower in our spacious en-suite rooms. Quality at a realistic prices. To book now, contact John or Sandra. Awarded 4 stars, Castlemont bed & breakfast is set in two acres of tranquil gardens and overlooking the beauty and famous sunsets of the Solway Estuary on one side and the peace of the Solway Plain on the other. Here, walkers and cyclists will find the freedom to roam uncrowded country roads, paths, lanes and trails of the Plain or marvel at the unspoiled beauty of the Solway Coast. A little to the north stands the regional capital of Carlisle, it’s castle, museums and cathedral and the historic landmark of Hadrians Wall. Castlemonts comfortable accommodation offers one double en-suite room, one double/family room sleeping 4 and one twin room, all with private facilities of t.v. and tea/coffee making equipment. Cots, baby sitting/baby listening service, internet facilities, ample safe car parking, secure cycle storage, laundry room and washing machine. Close to golf course and fresh water/sea fishing. Children welcome. No pets. Non smoking. Begin your day with a hearty breakfast from a choice of cereals, porridge, kippers, haddock and poached eggs, home cured ham or any combination of an English or Continental breakfast. Packed lunches on request. £35 per person based on 2 people sharing. Single occupancy from £40. Call or mail Eleanor Lines for the very best in bed and breakfast accommodation. Solway Shore Stories - A place where you will enjoy discovering more about the Solway Firth, the extraordinary stretch of water that both divides and unites the South-West corner of Scotland and the North-West corner of England.